Houston's Design-Build Kitchen & Bath since 1987. Best of Houzz 2018! Houston area woodworker specializing in custom cabinetry, built-ins, furniture, cutting boards, and other woodworking projects. At Madeval, we understand that every client has a unique story. They desire different aesthetics and demand functionality fit to their lifestyles. This is why at Madeval we have learned to listen — to celebrate these differences. By doing so, we can help our clients tell their story and create a home environment that is not only unique but perfectly suited to their needs. We have two categories to choose from, modern and transitional. Madeval designs and manufactures contemporary modular cabinets for kitchens, baths, and closets. Madeval has over 38 years of experience. Visit our showroom or contact us to receive professional guidance from one of our interior designers. Midtown Cabinetry & Designs specializes in designing, remodeling, and selling cabinetry for Kitchens and Bathrooms. We get excited about all our projects big or small and we treat every project with a custom touch. It is a labor of love for us and we bring that passion to each and everyone of our clients projects. We work with our clients to deliver a positive experience creating a space that they will enjoy for years to come. Whether you are updating your kitchen, remodeling a master bathroom, planning a new mudroom or building a home study; Midtown Cabinetry & Designs has the experience and passion to bring your ideas to life! Before founding the company in 2013, Matt Hegemier designed and sold cabinetry for an upscale kitchen design firm in the Houston area for more than 10 years. He also worked as a cabinet manufacturer's representative for a well-known cabinet brand, serving the Southeast Texas market. He even designed his first house when he was 12. Matt has a wealth of experience, industry knowledge, and professionalism to get the job done right and exceed client expectations. Midtown Cabinetry & Designs offers a full range of services, including project-specific consulting, measuring and design layout, materials selection, 3D computer rendering, and project management. We tailor our services to specifically meet the needs of each client. 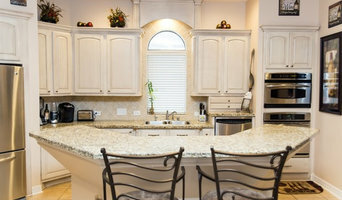 If you're not sure what you want, we offer recommendations about how to incorporate custom cabinets into your kitchen. With our full service approach, we guide clients seamlessly through the design/install process; presenting the very best options, maximizing the use of the latest design technologies, while delivering on the quality and integrity of our work. Our ultimate goal is to bring the client's dream space to life! Cabinetry Refinishing of Houston is locally owned and operated by Nathan and Stephanie Cook. We believe in old fashioned personal service and unsurpassed quality of work at very reasonable prices in every job we do. 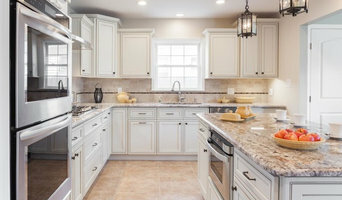 Reasons homeowners have their cabinets updated vary, some love their current cabinet structure but would just like a new door style and color change. Others want to add to or rearrange existing cabinetry. Those buying or selling an existing home also find a quick and affordable refinish to make their kitchen look exciting and decades younger. We use only the very best products available on the market, so you can rest assured you are getting a high quality and durable finish that will last, not just look good for awhile. Customers have called us artists at time and although there are touches of artistry involved in our work, craftsmen would be a better label. For over 20 years, Brandon has been providing the people of the Houston area with beautiful and functional cabinets at affordable prices. We are located in Tomball, Texas, Texas Direct Cabinets services Tomball, The Woodlands, Magnolia, Cypress, Houston, Katy, and many other Houston area locations. Texas Direct Cabinets focuses on offering the client a professional experience and an outcome that they will be happy with for years to come. We build quality cabinets with professional pride and integrity for any budget, from manufactured cabinets to custom works of art. We are here to improve your home environment through our business dedicated to quality home remodeling products. Accent Cabinets has over three decades of experience providing innovative design and quality custom cabinets. As a custom cabinet maker, there are no predetermined sizes or design constraints. Every detail of your project is built to your specifications by our experienced craftsmen. We take pride in offering our clients the highest standards of quality in both design and craftsmanship. Our top priority is to ensure our clients satisfaction. When you make the decision to work with Accent Cabinets, you gain our complete commitment to provide quality manufacturing and impeccable customer service. Accent Cabinets is committed to the highest standard of accountability, customer care, and customer satisfaction. We are confident that our relationship will continue long after your project is complete. If you are considering creating or recreating your dream living space please contact Accent Cabinets. We will help you make your design dreams come true. We look forward to hearing from you. Please do not hesitate to contact us today! Thank you for showing interest in Stylish Cabinets. You have come to the right place for high quality, affordable cabinets. Whether you are looking for kitchen cabinets, bath cabinets or any other cabinetry for your home, we have the solutions you need. All of our cabinets are made with the finest materials in the industry, including solid wood and high quality hardware. Let us help make your dreams a reality. Bring us your design, or have one of our experienced staff members help you design exactly what you are looking for. 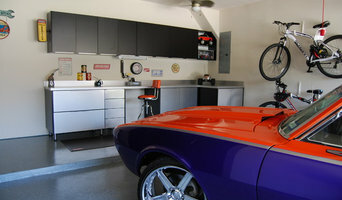 We offer professional installation in Houston and surrounding areas. Customer satisfaction is our number one goal. Please call us for more information or to set up an appointment at our showroom. 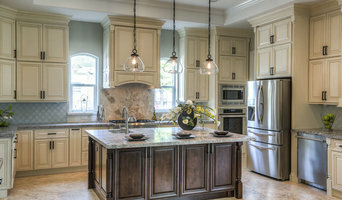 K & N Kitchen Appliances is a family-owned, full service appliance and cabinet center in Houston, Texas. We are located just west of Downtown Houston at 1401 Shepherd Drive, four blocks South of IH-10. Our modern 6,500 square foot showroom is the centerpiece for the display of all the major brand kitchen appliances, as well as our indoor and outdoor kitchen cabinet offerings. We employ a full-time design and sales staff with over 50 years combined experience in the kitchen appliance and cabinet industry, who are available to assist you in choosing the perfect solution for your home. At K & N Kitchen Appliances we also represent several lines of cabinetry, including Wood-Mode and Brookhaven, whose products will help you to create a beautiful and functional kitchen, bathroom, furniture piece or outdoor kitchen for your home. Door Masters of Houston is Houston’s leading manufacturer of custom solid wood cabinet doors and drawer fronts. Choosing the design and construction of a door has a tremendous impact on the overall look and feel of a room, and that is why we provide endless options with design, construction, and materials. With Door Masters of Houston, your doors will capture your style and add ambiance to your space. We invite you to look through our catalog and begin designing your very own custom look. If you can’t find what you’re looking for here, contact us to discuss the details – we have thousands of options to choose from. Kujo's is a small business started in Katy, Texas. We are specialized in kitchens, vanities, closets and trim carpentry. With our experience we help you design and customize what best fits your woodwork needs. USA Cabinet Store is a cabinet distributor offering multiple cabinet lines for all types of projects, including kitchen cabinets, bath cabinets, custom built-ins, office areas, entertainment areas and more. 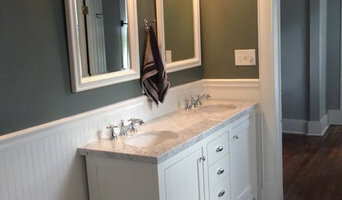 We offer high quality Custom, Semi-custom, and stock cabinets as well as our “cash and carry” option for select vanities. Our cabinets are plywood construction with solid wood frames (as well as full access European style frameless) with dovetail drawers and full extension drawer glides. These lines include a number of different door styles, with options of Solid Wood or Wood Veneer door and drawer fronts. The Mission of USA Cabinet Store and Design Center is to provide the best customer service, the highest quality of kitchen cabinets and bathroom cabinets, competitive pricing outstanding design and speedy deliveries. USA Marble and Granite is located across the street from our Fairfax showroom, and there are slabs located inside the same building at the Chantilly location. This is to provide you with “One stop shop” experience and convenience. We have over 100 slabs of granite marble limestone and quartz in-stock that can be viewed during normal business hours. USA Cabinet Store is committed to helping you find the best kitchen cabinets and bathroom cabinets for your project. To achieve this we offer a free 1 hour “in home consultation and measurement” or a 1 hour “showroom meeting” with one of our project designers by appointment. (normal business hours). We can also help by offering 3D drawings of your kitchen or bathroom. We invite you to visit our showrooms to find endless possibilities for your kitchen, bathroom, or any other room. In addition, Atascocita, TX cabinetry pros can help you give worn or dated cabinets a makeover. They can replace doors; add glass inserts, decorative moldings and other details; or give cabinetry a new coat of paint or specialty finish. Your cabinetry professional might work closely with a Texas kitchen designer, builder, remodeling contractor or interior designer. Here are some related professionals and vendors to complement the work of cabinets & cabinetry: Kitchen & Bath Designers, Kitchen & Bath Remodelers, Interior Designers & Decorators, Closet Designers and Professional Organizers, Woodworkers & Carpenters. Find a cabinetry professional on Houzz. Narrow your search in the Professionals section of the website to Atascocita, TX cabinets and cabinetry. You may also look through Texas photos to find examples of cabinets that you like, then contact the cabinetry professional who worked on them.